It’s important to keep your home and your business well maintained and fully prepared for the coming winter months, but do you give your car the same treatment? Unless you’re planning to be snowed in all winter, it’s more than likely that you’ll have to drive in heavy snow, with strong winds, or with low visibility. Being knowledgeable about winter car safety and how to conduct yourself on the road during bad weather is highly important. 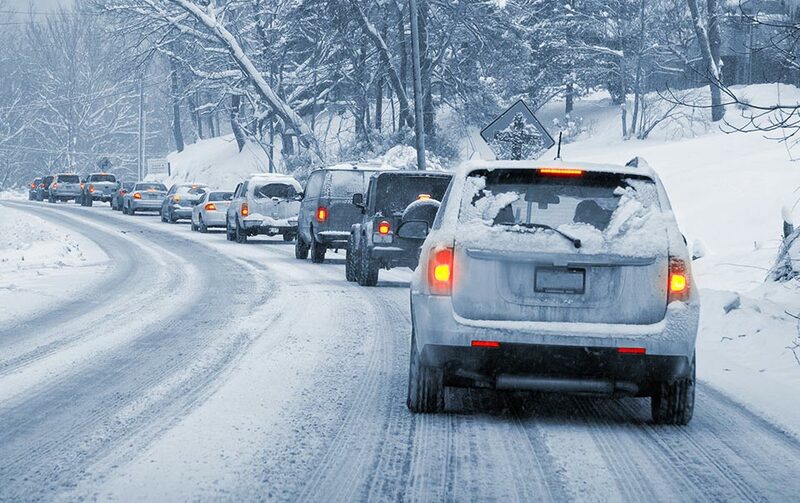 Read on for some of our top winter car safety tips, to keep yourself and others safe on the roads during the winter weather. A survey conducted last year by the Tire and Rubber Association of Canada (TRAC), found that only 51% of Canadian drivers use winter tires – except in Quebec, where they’re required by law to have them. Ontario itself was found to have a 56% adoption rate, with most drivers believing that all-weather tires were ‘good enough’ for the winter. Though they can be costly and a hassle to have installed, in our opinion, the safety factor more than outweighs the cost! In the two years since Quebec adopted its mandatory policy, road traffic accidents have dropped 5%. Another thing to remember, is to check the pressure of your tires when the weather gets colder. A drop in outside temperature means a loss in tire pressure. During the colder weather, your motor oil can thicken, which makes it difficult for it to reach the upper parts of the engine as you start it. If you aren’t already using it, try making the switch to synthetic oil. Synthetic oil doesn’t thicken in colder weather like regular motor oil, meaning that it will flow easier and more consistently. Windscreen wipers only last about a year at the best of times. The colder weather can cause the rubber to crack or chip even sooner, and you’ll need them in tip-top shape if you get caught in a blizzard! Make sure you check them before the weather gets too cold, and replace them if they need it. Also make sure to check your washer fluid reservoir, making sure it is fully filled –you’ll need it! Take things slow, there’s no need to rush! Even if you’re driving down a road that you know like the back of your hand, heavy snowfall can cover a multitude of hidden items that weren’t there before, such as a fallen tree branch or stop sign. Take your time, and make sure to pay attention to the road and to other drivers. It doesn’t matter whether you’re driving a hatchback or an SUV, no vehicle is impervious to winter weather. If you’re turning a corner and the back wheels decide they want to go in the opposite direction, quickly turn in the same direction as the rear wheels. This is called ‘oversteer’, meaning the back of the car has kicked out and you as the driver need to compensate for this by bringing things back into line by turning the wheel into the opposite direction of travel. Make sure to take it slow, ease of the gas, and keep both hands on the wheel until the tires come back under your control. Great post, Stacey! I also added a “Winter Survival Kit” to my trunk (shovel, flares, warm blanket, etc).